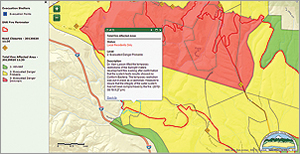 ArcGIS Online has become the county's one-stop location for all GIS-related projects. For Kittitas County, Washington, better fire response isn't a matter of more hose lines and fire trucks. It's a matter of information. For every major incident, fire fighters need information, and so do command staff and the public. For everyone involved, providing continuously updated information to help battle the blaze and keep the public informed is paramount. On August 13, 2012, the season's first major wildfire in Washington started between Interstate 90 and US Highway 97 in Kittitas County. Dubbed the Taylor Bridge Fire, it quickly burst out of control and spread, threatening homes and people. The fire was fully contained on August 28 after burning 23,500 acres and destroying more than 60 homes. "We are positioning to be a central repository for GIS data for surrounding agencies," says Jason Eklund, GIS coordinator for the Kittitas County Information Technology department. 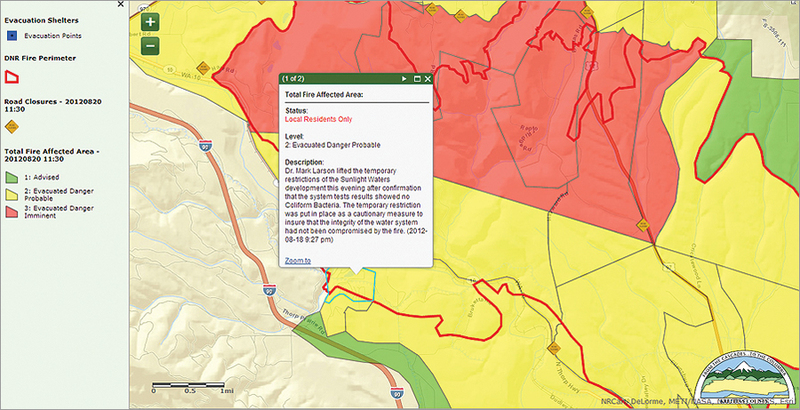 "With the Taylor Bridge Fire, there was an immediate need for mapping. We needed to get information out to the fire crews, the State of Washington Emergency Operations Center [EOC], FEMA [the Federal Emergency Management Agency], and the public." Brenda Larsen, fire marshal for Kittitas County, said the mapping by county staff was instrumental in providing timely and accurate information about the fire footprint to first responders and fire crews, helping them work safely. "Our GIS mapping staff at EOC was indispensable, and their work made it easier for everyone involved in the fires," Larsen says. With a population of more than 40,000, Kittitas County is located in central Washington State. It spans the lush, forested Cascade Mountains to the upper Yakima River Valley plains and the Columbia River. Its county seat is Ellensburg, which is also the county's largest city. When the fire occurred mid-August, the new system was ready. 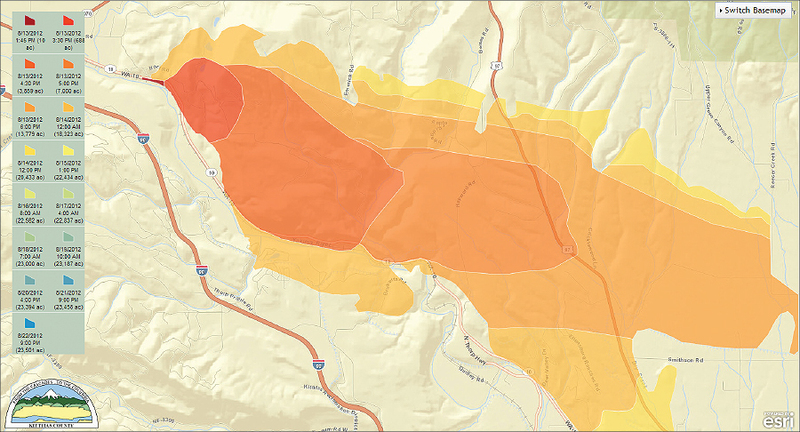 Web GIS served as the perfect platform to map the fire's perimeter, determine the terrain, and identify assets at risk, all of which were immediately delivered through the cloud to first responders. "Having the service in the cloud took the pressure off our servers so we could continue to serve the public without downtime," says Eklund. "The interactive mapping allowed EOC to instantly update our emergency action plans," says Gene Dana, Kittitas County sheriff. "The maps were used at our responder briefings and at several town meetings to help illustrate the movement and hazards associated with the incident. Frequent status updates through maps to the media and incident command websites reduced the volume of phone calls to EOC and provided for a more informed public." "As far as logistics, I found the system to be extremely useful," says Kelly Carlson, logistics manager, Kittitas County EOC. "The road closures feature was a crucial element on the live mapping since these were changing constantly as the fire moved. Again, this was extremely helpful as far as the EOC hotline was concerned in that we could give accurate information to the public." "Fire mapping helped set up evacuations, send in supplies, identify vulnerable areas, set up staging areas, and more," adds Carlson. "Combined with fire behavior knowledge, it allowed commanders to strategize based on factors such as topography, natural vegetation, and natural barriers and provided a basis for wildland fire fighting. It showed key factors that affect ground crews and fire behavior and provided commanders with up-to-date fire movement information.